In the Settings menu, you’ll see abilities to configure your Background, Surface Pen and Gestures. Background: You can scroll through these options and find many basic paper types with subtle textures, as well as plain white, transparent, blueprint and darkprint. We also give you the option to create a custom color background from the COPIC color wheel. 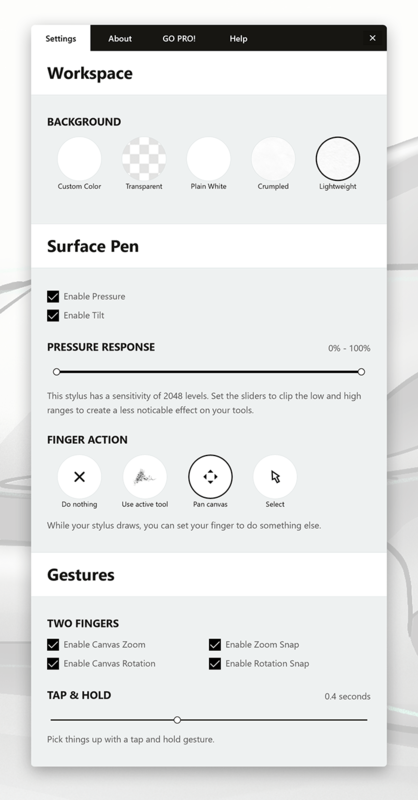 Surface Pen: The Surface Pen can be configured for pressure and tilt, and if you’d like to smooth out the pressure response a bit, you can use the slider to clip the percentage range down on each end. Also, when using the Pen, you can set your finger action to something different like panning the canvas or selection (or to use the active tool or do nothing), so that your workflow is that much faster. Gestures: At this point in time we have a two-finger gesture available for moving (drag two fingers) and zooming (pinch or expand two fingers) about on the canvas. You can configure that here. Beneath the two-finger action is a slider that allows you to set your timing for how long you tap+hold to select objects. Some like it fast, others prefer it slow, choose a timing that works well for you. The other tabs in the Settings menu allow you to learn more about Concepts, visit the Pro Shop, and find help. Besides helpful links to our videos, FAQ, articles, website and manual, you’ll see a link to Ask Us Anything, which sends us a direct message about your troubles. You can expect to receive a reply in-app within 24 hours.